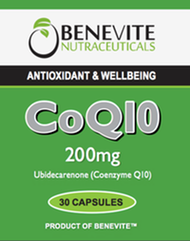 Benevite Nutraceuticals™ Coenzyme Q10 (CoQ10) is essential for the production of energy in the body and supports stamina and endurance. CoQ10 assists in the maintenance of the cardiovascular system by maintaining healthy heart tissue and supporting the health of the blood vessels. 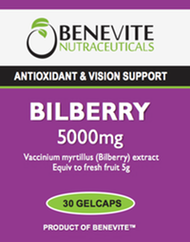 It also assists to maintain normal blood pressure and healthy cholesterol levels in healthy individuals. 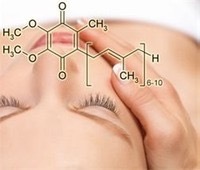 The antioxidant properties of Coenzyme Q10 assist in protecting the cells from free radical damage. The levels of CoQ10 in the body decline with age. Supplementation with CoQ10 100mg can help to maintain and improve general well-being. * Coenzyme Q10 is found in the mitochondria of the body cells, where it plays an essential role in the electron transport chain and ATP synthesis. * CoEnzyme Q10 is involved in the production of energy through its essential role in the electron transport chain. * Coenzyme Q10 is a potent antioxidant, or free radical scavenger. * The antioxidant properties of Coenzyme Q10 assist in protecting the cells from potential free radical damage / damage attributed to free radicals. * Assists in the maintenance of a normal/healthy cardiovascular system. * Assists in the maintenance of healthy heart function. * Maintains healthy heart tissue. * Supports the health of the blood vessels. * Coenzyme Q10 may assist in maintaining normal, healthy blood pressure in healthy individuals. * The amount of coenzyme Q10 in the body decreases with age. * Supports stamina and endurance. * Helps perform in peak condition. * May help maintain normal (and/or healthy) cholesterol in healthy people. * Assists in the maintenance of a healthy immune system. * Coenzyme Q10 supports healthy immune function. A 2002 study reported that, in rat experiments, coenzyme Q taken as dietary supplement reduced radiation damage to the animals' blood. Studies have shown that diseased gum tissue is deficient in CoQ compared to healthy gum tissue. Human clinical trials have suggested a link between oral administration of CoQ10 and improved gingival health, immune response in gum tissues, and a reversal of the diseased gum conditions. In addition to oral supplementation, topical application of CoQ10 on gum tissues has been shown to improve periodontitis and gingivitis conditions. There are several reports concerning the effect of CoQ on blood pressure in human studies. A recent (2007) meta-analysis of the clinical trials of CoQ for hypertension reviewed all published trials of coenzyme Q forhypertension, and assessed overall efficacy, consistency of therapeutic action, and side-effect incidence. Meta-analysis was performed in 12 clinical trials (362 patients) comprising three randomized controlled trials, one crossover study & eight open-label studies. The meta-analysis concluded that coenzyme Q has the potential in hypertensive patients to lowersystolic blood pressure by up to 17 mm Hg and diastolic blood pressure by up to 10mm Hg without significant side-effects. A 2002 study in 80 Parkinson's disease patients found 1200 mg/day reduced the progression by 44% & a phase 3 trial of 1200mg/d & 2400mg/d should run until 2011. One study demonstrated that low dosages of coenzyme Q reduce oxidation & DNA double-strand breaks, & a combination of a diet rich in polyunsaturated fatty acids & coenzyme Q supplementation leads to a longer lifespan in rats. Coles & Harris demonstrated an extension in the lifespan of rats when they were given coenzyme Q supplementation. Another recent study shows a survival benefit after cardiac arrest if coenzyme Q is administered in addition to commencing active cooling of the body to 90–93 degrees Fahrenheit (32–34 degrees Celsius). CoQ is also being investigated as a treatment for cancer, and as relief from cancer treatment side-effects. Supplementation of coenzyme Q has been found to have a beneficial effect on the condition of some sufferers of migraineheadaches. So far, three studies have been done, of which two were small, did not have a placebo group, were not randomized, & were open-label, & one was a double-blind, randomized, placebo-controlled trial, which found statistically significant results despite its small sample size of 42 patients. Dosages were 150 to 300mg/day. Coenzyme Q10 helps to maintain a healthy cardiovascular system. There is evidence of CoQ10 deficiency in heart failure. Recently, CoQ10 plasma concentrations have been demonstrated as an independent predictor of mortality in chronic heart failure, CoQ10 deficiency being detrimental to the long-term prognosis of chronic heart failure. CoQ10 is available as medicine in several European countries, but is in these countries also available as a food supplement. Oxidation of the circulating LDL is thought to play a key role in the pathogenesis of atherosclerosis, which is the underlying disorder leading to heart attack and ischemic strokes and CHD. Studies in the last decade have demonstrated that the content of Ubiquinolin human LDL affords protection against the oxidative modifications of LDL themselves, thus lowering their atherogenic potency. Supplementation of coenzyme Q is a treatment for some of the very rare and serious mitochondrial disorders & othermetabolic disorders, where patients are not capable of producing enough coenzyme Q because of their disorder. Coenzyme Q is then prescribed by a physician.